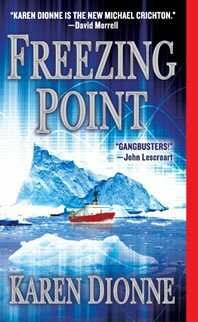 Karen writes here about the debut of Freezing Point, and I can’t urge you strongly enough to check out her very cool (yes, I said it!) revolutionary launch site. 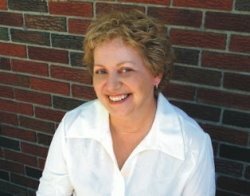 And on Wednesday, she’ll be appearing at Susan Henderson’s LitPark with heavy-hitters Barry Eisler, David Morrell and Gayle Lynds. I discovered an interesting thing about myself on the road to publication: I like marketing and promotion. I enjoy thinking up promotional ideas that are a good fit for me and my novel. And because I’d much rather lead the pack than follow it, some of the things I’ve tried are a little outside the norm. I sent my novel on a “Freezing Point Pre-Publication World Book Tour” without me (a reasonable success), and set up a Freezing Point “Star in My Book Video” contest (not quite as successful). But the centerpiece of my personal marketing plans was the online book launch party I threw last week, which turned out to be every bit as wonderful as I had hoped. The website saw more than 2,700 visitors, and 400 people left comments in the guest book – many of them friends and coworkers I hadn’t been in touch with for years. I got the idea for an online launch party over a year ago, when I realized that no matter where I held a real-world book launch, only a fraction of my friends would be able to attend. So with help from a dozen thriller authors including Lee Child, Doug Preston, John Lescroart, Gayle Lynds, and James Rollins, I threw an online book launch where family, friends, and fans could mingle and win prizes – and catch the buzz about my novel in the process. Entertainment for the event included video welcomes from the best-selling thriller authors who had given me blurbs, a reading by a professional voice actress who’s also a New York Times author, stand-up, a compilation clip with four authors who write series characters answering the question “Would Your Character Read Freezing Point” – even testimony from a thriller author who’s also a medical doctor regarding the science behind my story’s premise. There were door prizes: a boxed set of the BBC’s “Planet Earth” series on DVD, bottles of genuine iceberg water, and Penguin Gear from my publisher. And because a book launch party wouldn’t be complete without, well, books, two independent booksellers made signed copies available. Naturally as authors, we tend to think first in terms of words. But on the Internet, we’re not limited to text. I can easily imagine authors putting similar audio and video endorsements on their regular websites. They’re certainly easier and cheaper to produce than a book trailer, and quite possibly, more effective. To a Web 2.0 generation accustomed to tag clouds, wikis and widgets, our static text-and-images-only websites run the risk of looking as outdated as Fred Flintstone’s writing tablets. The good news is authors don’t have to be afraid of the Internet. We’re writers. We’re creative people. We can figure out how to use the Internet to spread the word about our books in new and exciting ways. So now I’ll turn the mike over to you. What cool and interesting things have YOU done to promote your books on the Internet? Thanks for being here, Karen! Great interview. I like the fact that you embraced marketing AND enjoyed it. And I agree the video clips are very powerful, a blurb coming alive. Congratulations on the book, Karen – great interview! But…ack! What have I done that was cool and different in terms of promotion??? I’m drawing a blank! Surely I must have done something at some point… Does it count that when my family signed copies of THE SISTERS EIGHT a few weeks back at NEIBA, 8-yr-old Jackie signed with a stuffed red lobster on the counter and a glass pen with a flower and feather attached? Her presentation, combined with the smiley faces she put inside the “a” in her name were a big hit! Great to see you here. I visited your launch party and it was great. How long did it take you to put all that together? Congrats on the book, you know I’m already a fan. Hi, Mary-Frances and Lauren and Liz! Nice of you all to drop by! Lauren – your daughter’s signing idea sound adorable – nothing like training her young! And thanks for visiting my online launch party. I worked on that site for around a year – not constantly, of course, but there were a fair number of hours in it, for sure. Having such a long time to get it ready was nice, though, because it gave me lots of time to think of interesting ideas. And of course, if I didn’t have a genius of a webperson, none of it would have happened! Congratulations on Freezing Point, Karen. I’m going to look out for a copy and I’m heading over to your site now for a look. And I love the idea of an online launch party.